Hey Davao, guess who’s coming to town next week? MEEEEEEE! I’m so excited to meet all my Davaoeño and Davaoeña readers this January 30 at SM Lanang Premier! We’ve prepared so much for you! The program will start at 6pm at SM Lanang Premier’s The Atrium. We’ll start with an interactive interview/talk with me, followed by a fashion show featuring the latest fashion scoop for 2015 styled by yours truly, then a short meet and greet for photo ops to close the event. It’s going to be one awesome bonding session! I don’t know if an event like this will ever happen again and I really want to meet all of you, so please do drop by. See you there!!!! Hi Camille, what school can you recommend to learn about the basics of fashion? thanks! Hi camille Co….to begin with, i just want to say that i really love ur style.. see you tommorow at Sm lanang..i hope ill get a selfie photo with you.. thanks for coming to davao! 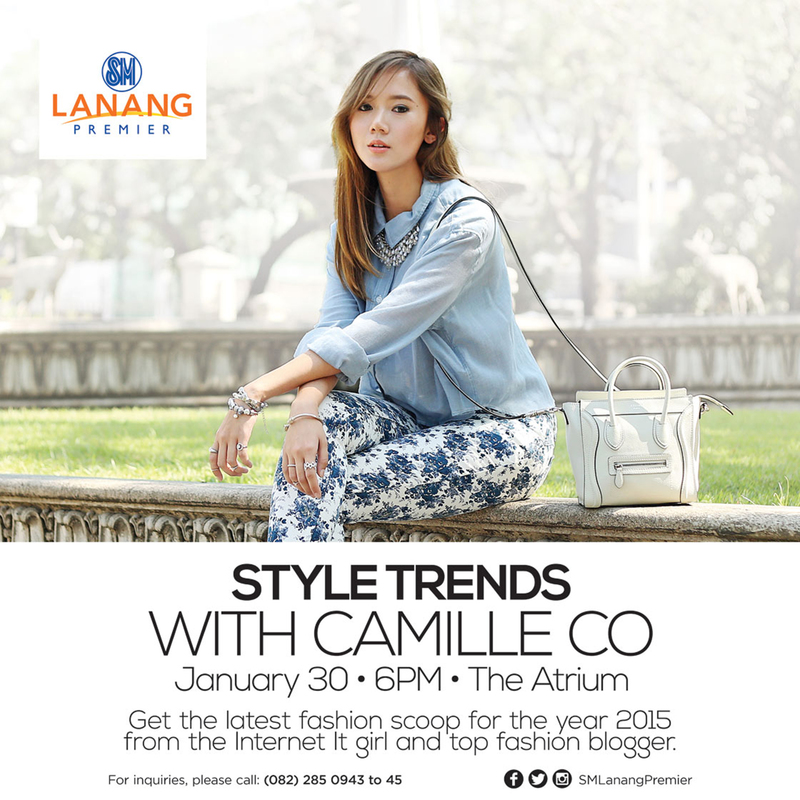 Hi Camille what brand/s will you style for the fashion show? OMG..how i wish to run away from my work hehhee…after work hope is not so traffic then..
HIII POO!I wish I could see you po in person. It’s really my dream to meet you Ms Camille. Thank you po because you really help me a lot po in fashion designing especially when I draw/sketch some design. God Bless po. Wow! I hope you’ll come visit us here in Cebu next time Ms. Camille. Break a leg in Davao! Hope you’ll have one in Cebu soon Miss Camille! :) I really want to see you in person. hi camille co! I can’t wait to see you here in Davao. I’m really excited for your fashion tips for us. Is this free?? I hope I can meet and greet you . your blog is adorable ! !